The Loudoun Sketch Club has a wonderful holiday party tradition. Every artist brings a 5 x 7” handmade card in a plain envelope. Each artist gets a number, and the cards are given out at random. Its such fun to get a lovely card painted by one of my artist friends, but making the card is the best part. This year, I decided to do something inspired by my textile design days for my card. Snowflakes were always a favorite design element for me, and every year, I created at least one group of designs featuring snowflake motifs. I love the way snowflakes are geometric, but also reminiscent of flowers, and I often use quite a bit of artistic licence when drawing my snowflakes. I also enjoy working with masking fluid. 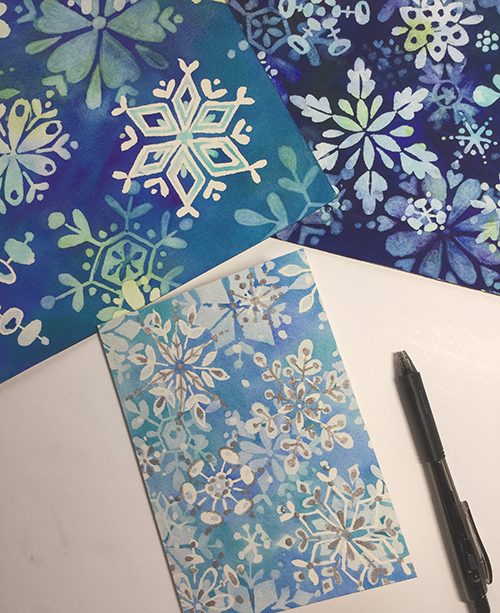 In this project, I use the masking fluid to “draw” my snowflakes. I find the process almost meditative. The repetition of the shapes, and placement of layer upon layer always calms my mind. It is a project that requires a bit of patience, and I find its best done step by step with a long drying time in between layers. liquid masking fluid - any brand will do. I like the tinted kind for this project, because its easier to see what you are doing. watercolor block - I like cold pressed, but you can do this with hot press too. Sometimes, I start by drawing a page of snowflake shapes, but after years and years of designing snowflakes, I have become more improvisational with them. There are photographers who have taken magnified photographs of individual snowflakes. Look at them to get an idea of how they are formed, and for ideas of the shapes you will use. Notice how they are never really symmetrical; There are bits missing and parts that are different. If real life snowflakes are not perfect, then you are free to make yours less than perfect too. 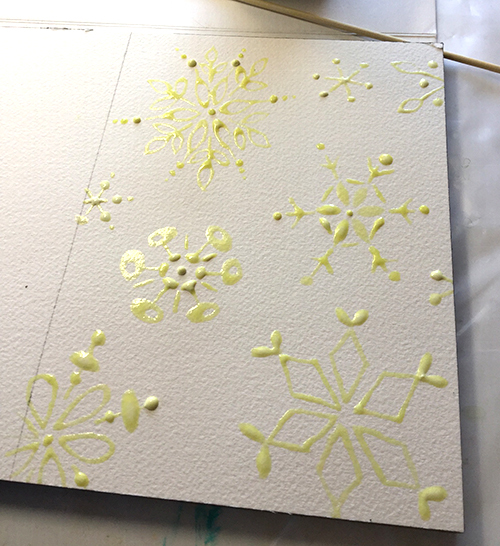 Once you have your snowflake ideas down, its time to start drawing them with masking fluid. I don’t sketch first, i find it is more enjoyable to place the snowflakes by intuition, and design them as I go. The first layer will be pure white, so I keep my lines thin, and will include more detail. I find that using a wooden skewer as a drawing tool works nicely. Keep a bit of paper towel handy to wipe it off from time to time so it doesn’t leave blobs. The masking fluid takes a long time to dry. I have occasionally gotten impatient with this part, and used a hair dryer. This is a risky business, because the masking fluid will sometimes seem dry, but it is only dry on the surface. You don’t want to smear it or get it in your watercolor brush. Once the masking fluid is really dry, you can start to add some color. I like to use colors that are close to each other on the color wheel - blues and aquas, or reds and oranges for example. I begin by getting the paper very wet, and adding very watered down color. It is interesting to add a dot of a color and let it spread its way across the paper. Try tilting your page and letting the color drip down. Cover the entire image with the color, or let the color fade out at the edges. You can texture the color by blotting it with some bunched up paper towel or toilet paper, or sprinkling salt on top of the wet paint. Then go do something else while the watercolor dries. When your watercolor is fully dry, you can add another layer of masking fluid. I like to add some details to the snowflakes I drew on the previous layer, (in the photo below, those added details look greenish) and add some more snowflakes. Each subsequent layer of snowflakes should be a bit bigger and less detailed than the ones that are pure white. Then go watch a movie or paint something else while the masking fluid dries. The next layer of watercolor is painted the same way as the first, except for one detail - its a little darker. How much contrast there is between the layers of watercolor is up to you. I have had success with using a mid-tone in this layer, and also with a very soft subtle difference in color. It all depends on the mood you want to create. Once you get this layer down - you guessed it - go do something else for a while until it is fully dry. The reason I stress setting it down and doing something else while it dries is because impatience could ruin your work. I like to get the paper so wet, a hairdryer will either spray the paint everywhere (but maybe that’s an effect you want) or it won’t dry the paint completely and the next layer of masking fluid could remove the color when you take it off. The last layers are the same as the ones before. The only difference is that the third and final layer of snowflakes are the biggest, and simplest in design. They are meant to add some texture and interest to the background. Once all your layers are completely dry, you get to the fun part - peeling off the masking fluid. You can use a rubber cement pickup to carefully take all the layers of liquid mask off your painting. .I love to see the image revealed as the mask comes off. If you want to turn it into a card, carefully score the paper with an x-acto knife on the outside where it will fold. The trick here is to score lightly enough to avoid making the fold too weak and susceptible to tearing., but deep enough to be able to get a nice fold. I hope you have fun with this project! If you try it, please send me a photo! I’d love to see what you did! 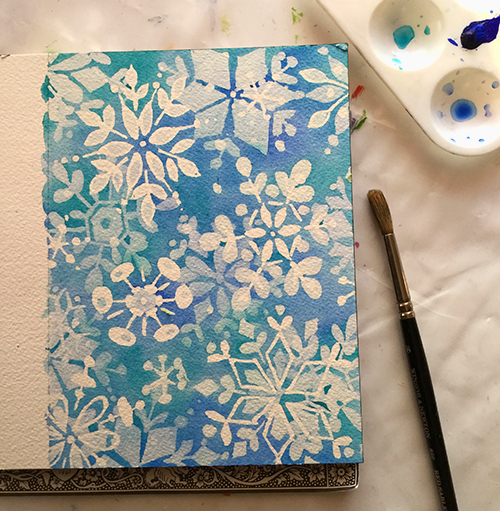 You don’t have to limit yourself to snowflakes - experiment with different kinds of shapes, or styles of art. Wouldn’t it be fun to design your snowflakes with an art deco or mid-century modern theme? Or how about some metallic paint on top? You can take this in so many different directions.